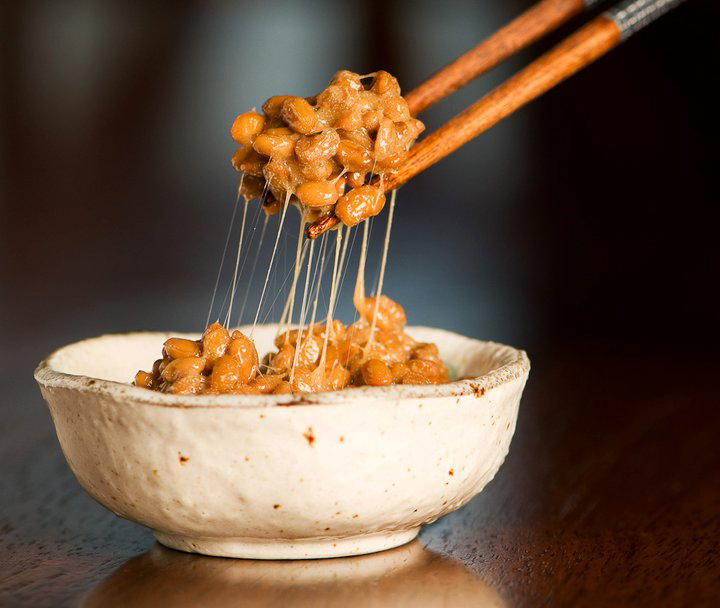 Natto is a traditional Japanese food which is made from soybeans usually fermented with Bacillus subtilis var. natto. It is consumed as a breakfast food with fish and miso soup . Usually it is served with karashi mustard, soy sauce and Japanese bunching onion. 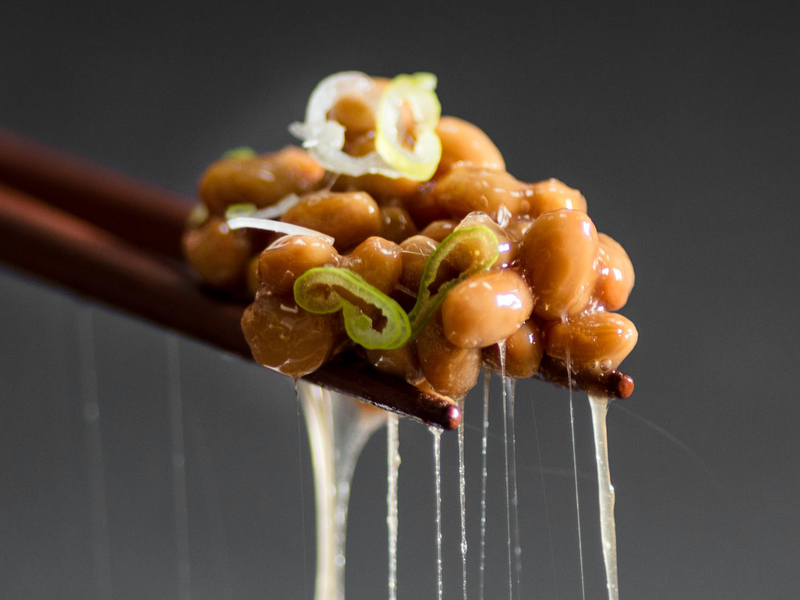 Natto may be an acquired taste due to its strong flavor, powerful smell and slimy texture. For some people, ammonia smell may induce the mixture of cheese and old socks. The texture resembles stringy, gooey and sticky small bean which adds unappealing nature. 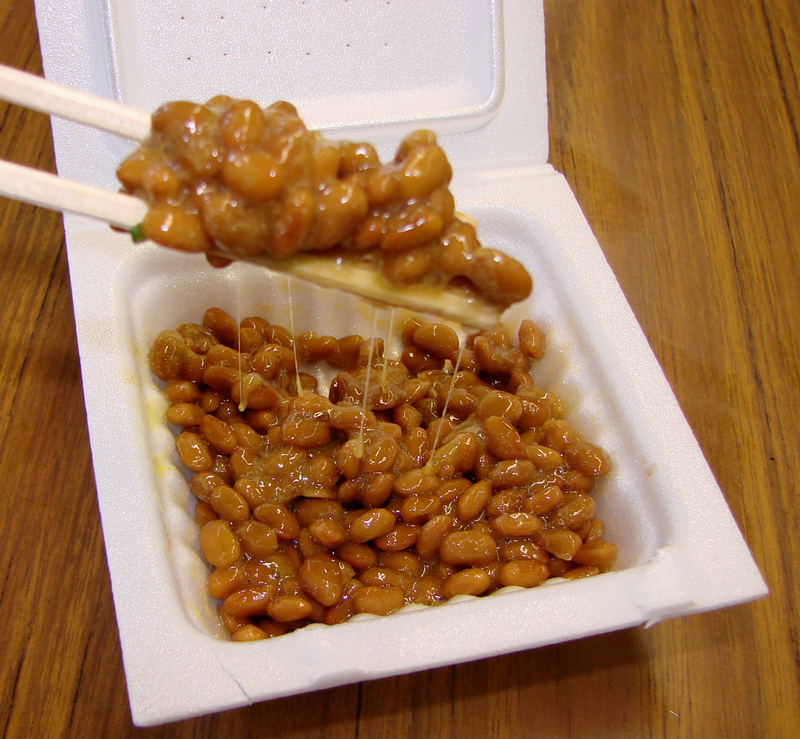 Natto is most popular Japan in eastern regions such as Tōhoku, Kantō, and Hokkaido. 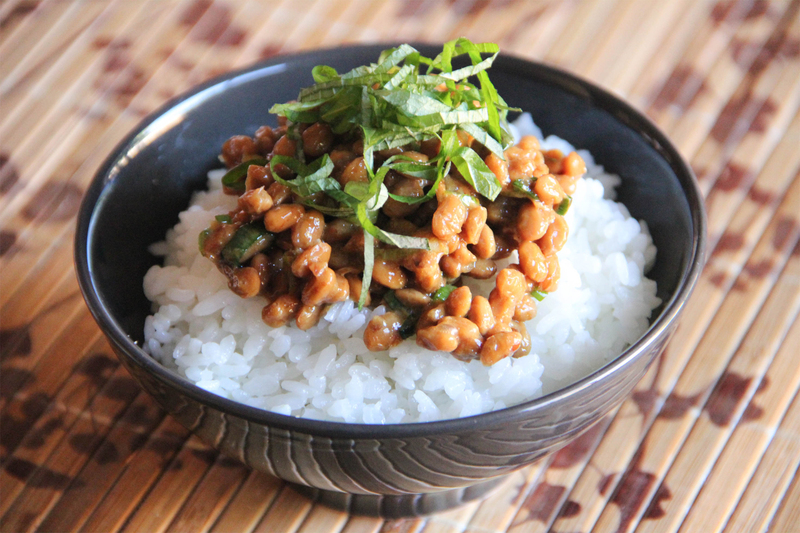 As Natto is fermented, it provides numerous health benefits. Natto is prepared by soaking whole soybeans, boiling them and then adding bacteria called Bacillus subtilis to the mixture. After that it is allowed to ferment at 40 °C (104 °F) for up to 24 hours. Then it is cooled and aged in refrigerator for one week to allow then to develop stringiness. Natto comprises of different nutritional value in comparison to raw soy beans by losing Vitamin A and several other minerals and vitamins. It has low content of calories than raw soy beans. It has softer dietary fiber without the presence of high content of sodium which is found in many other soy products. It does not contain cholesterol and is an excellent source of calcium, iron, protein, magnesium, vitamin B6, E, B2 and potassium. Japanese people consume it by combining it with eggs and are eaten with rice. It is the richest source of natural K2 which is associated with maintaining bone health. 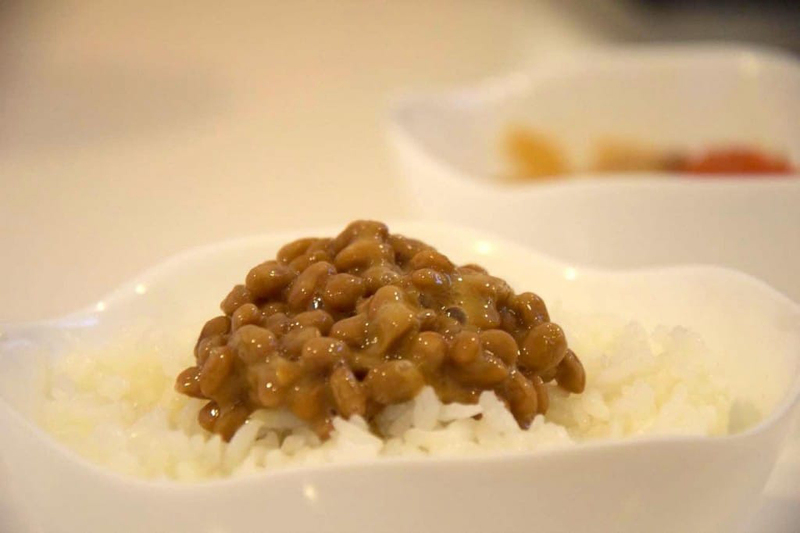 Natto has isoflavone which promotes balance of hormone and lecithin that regulates intestine functions, eliminates bacteria and recovers fatigue. Moreover, it has high content of enzymes that prevents high blood pressure and eliminate blood clots. Besides this, magnesium, calcium and dietary fiber could be found in it. 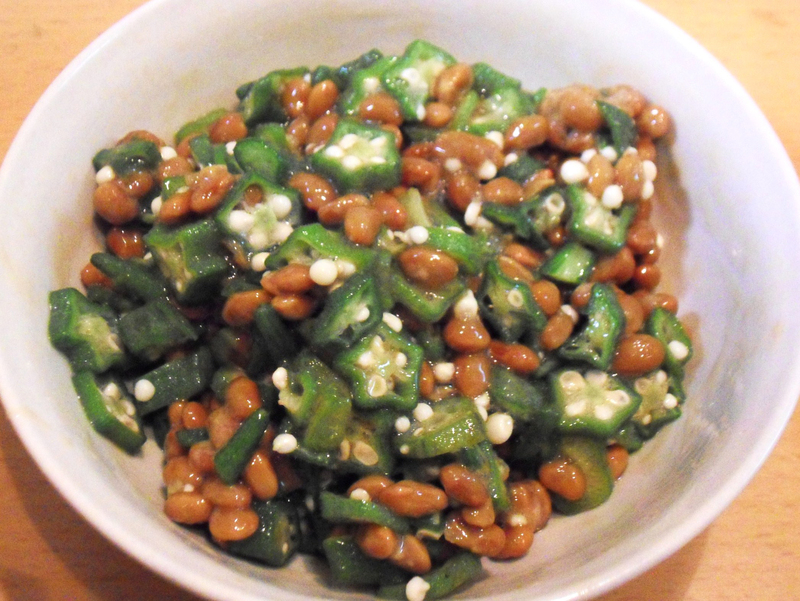 Sources differ on an earliest origin of Natto. One theory indicates that Nattō was codeveloped in the distant past in multiple locations. Since ancient times, in Japan, it is simple to make with ingredients and tools commonly available. In northeastern Japan, Minamoto no Yoshiie was on a battle campaign between 1086 AD and 1088 AD. One day, while they were boiling soybeans for their horses, they were attacked. Hurriedly they packed up the beans and did not open straw bags for few days. Few days later the beans had fermented. The soldiers consumed it anyway and liked the taste. They also offered some to Yoshiie who also liked the taste as well. It might be possible that the product was identified independently at different times. In Taisho period (1912 to 1926), one significant change in the production of Nattō occurred, when researchers found the way for producing Nattō starter culture which contains Bacillus subtilis without the use for straw. It produced more consistent results. 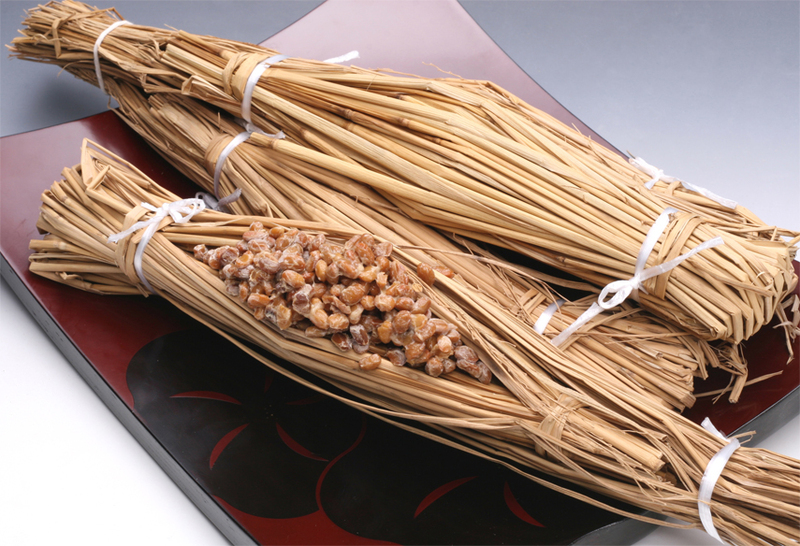 Though Natto do not provide good impression at first sight, it is loaded with powerhouse of nutrients. It is a rich source of protein and an excellent source of fiber, omega-3 fatty acids and moderate amount of vitamin C. It is a great source of iron, manganese, magnesium, copper, zinc, potassium and calcium. Phosphorus and calcium is needed for forming teeth and bone structure, magnesium, calcium and potassium helps to regulate blood pressure. Fermenting process produces enzyme nattokinase which promotes ability of the body in preventing blood clots. It is also a great source of Vitamin K2 which assists blood to clot. Vitamin K2 is also helpful for maintaining bone health. The regular intake of Natto lowers the chances of osteoporosis. Natto has rich amounts of Vitamin K. K2 is essential component for maintaining bone mineral density of postmenopausal women who suffers from osteoporosis. Vitamin K is of three basic types such as K1, K2 and K3. K1 is found in plant foods and green vegetables are the best source of this vitamin. K2 is made from K1 and K3 by bacteria and other microorganisms. It could also be made in human body through conversion process involving K1 and K3. It is great for vegans and vegetarians because generally Vitamin K2 could be obtained by consuming meat and other animal products. Vitamin K2 is also beneficial for maintaining heart health. It helps to prevent hardening of arteries that leads to heart failure and coronary heart diseases. It also prevents age associated neurological degeneration and kidney stones. The fermentation process makes proteins found in Soybeans more easily digested as well as absorbed which is helpful for those having gut issues when consuming legumes. Natto doesn’t trigger gastrointestinal discomforts like soy due to the content of enzyme nattokinase which is created during fermentation process. Nattokinase is used for various medicinal purposes. 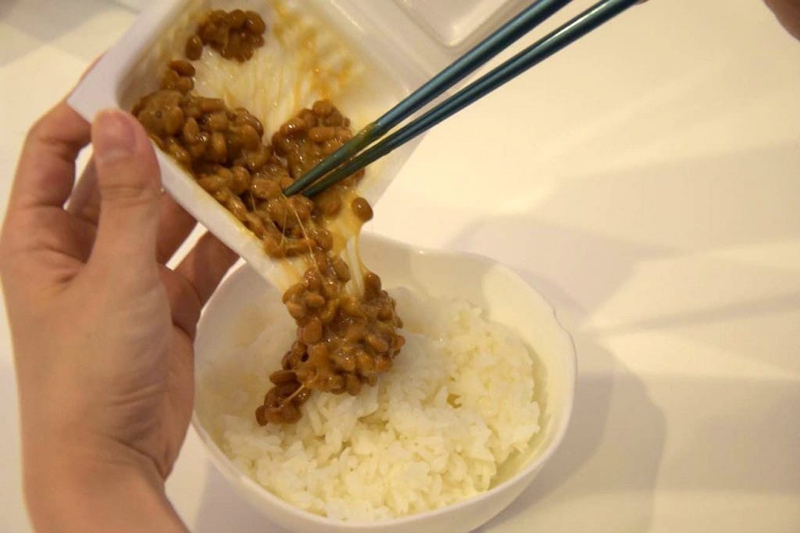 Natto is rich in probiotics content. Bacillus subtilis is the bacteria which is added to Soybeans and then left to ferment for making Natto. 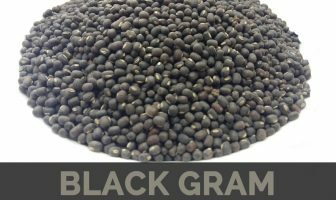 It produces enzymes that are used to lower blood clotting and produce B vitamins and Vitamin K. It is used to improve irritable bowel syndrome and also useful for preventing allergic disorders, treat gastrointestinal conditions, fight cancer and increase immune reaction of intestinal cells. 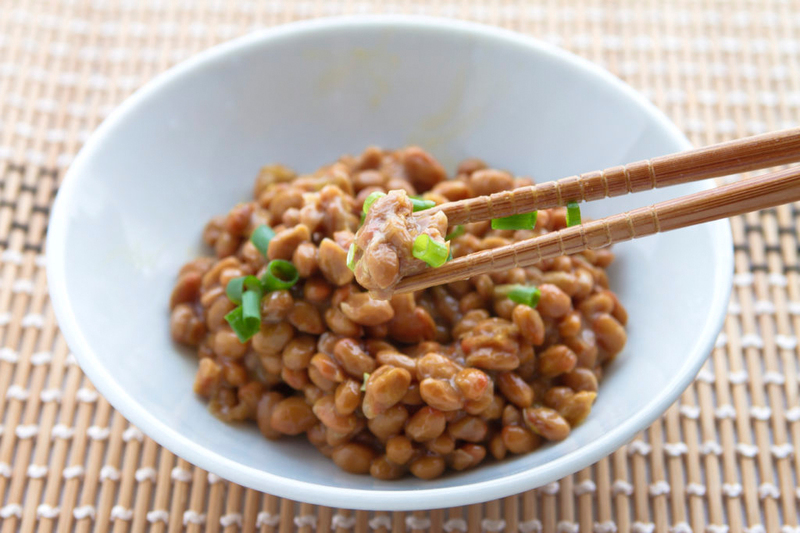 Natto has several nutrients that assist in strengthening immunity. Natto contributes to healthy gut flora which prevents growth of harmful bacteria and enhances production of natural antibodies. Additionally, probiotics lowers the chances of infection and assist to recover faster during sickness. The diet rich in probiotics lowers the need of antibiotics to recover from infection. Apart from high content of probiotics. Natto is rich in iron, vitamin C, selenium, zinc and copper which plays vital role in immune function. It prevents damage caused by free radicals which could result in cancer as well as degenerative diseases such as cystic fibrosis and macular degeneration. Natto is the fermented soy which uses bacillus natto species. Nattokinase is an enzyme which acts as a strong anti-inflammatory, anti-clotting and blood thinner. It is similar to aspirin without any harmful side effects. Nattokinase effectively destroys toxic amyloid fibrils related with Alzheimer’s disease. 100 grams of Natto provides 217 milligrams of calcium which is 22% of daily recommended intake and 115 milligrams of magnesium which means 29% of daily recommended intake. It is known to all that calcium is essential for maintaining strong teeth and bones but magnesium is needed for calcium absorption. These minerals are found in Natto which is effective for building bones and protects body from bone related diseases such as osteoporosis, gout and arthritis. 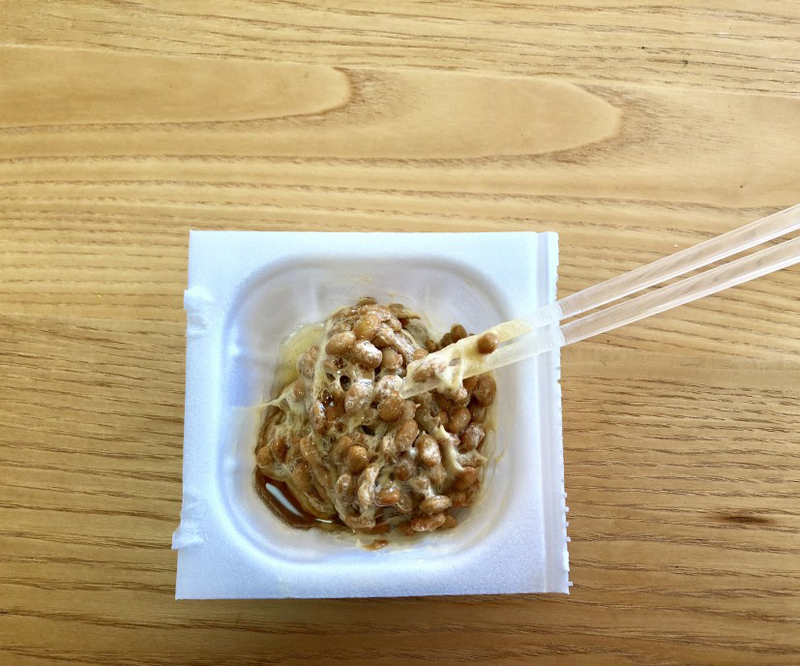 Natto is an excellent source of nutrients such as iron and protein for vegetarians and vegans that could normally be obtained from meat and meat products. 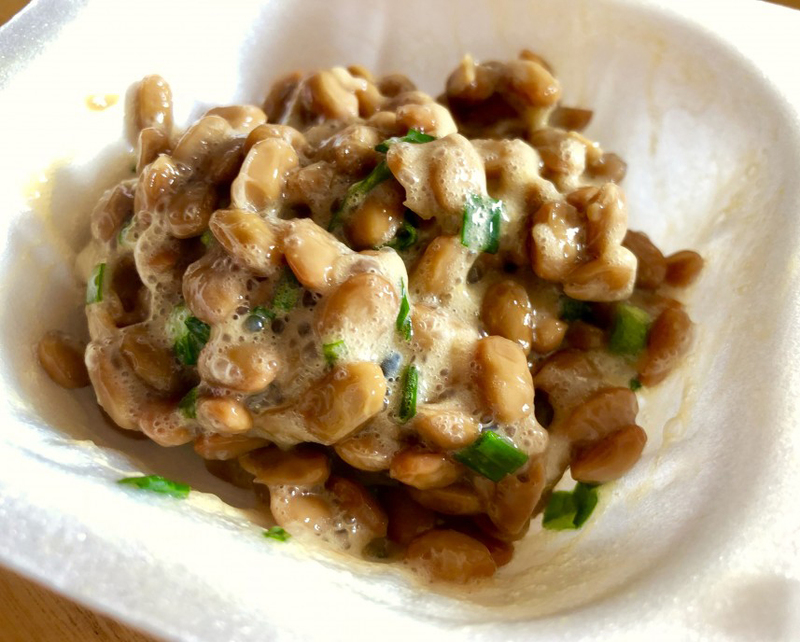 100 grams of Natto provides 17.7 milligrams of protein that includes all eight essential amino acids that provides 35% of daily recommended intake. It provides 8.6 milligrams of iron which is 48% of daily recommended intake. Protein assist to build cells and muscles and iron is essential for transporting oxygen to lungs. 100 grams of Natto offers 212 calories and 5 grams of dietary fiber which makes it an effective option for those who are trying to lose weight. The same amount provides 11 grams of fat so one should not be worried about gaining weight as these good fats are required by the body for energy. 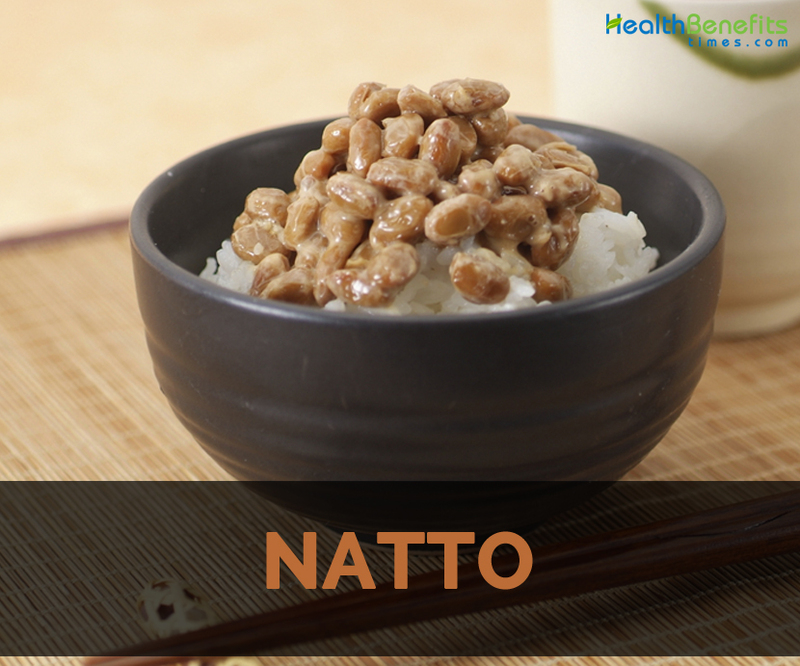 Natto comprises of lecithin, lenoleic acid and fiber which assist to purify blood and improve digestion. It is rich in Vitamin PQQ which could be obtained through diet and is required for maintaining beautiful and healthy skin. 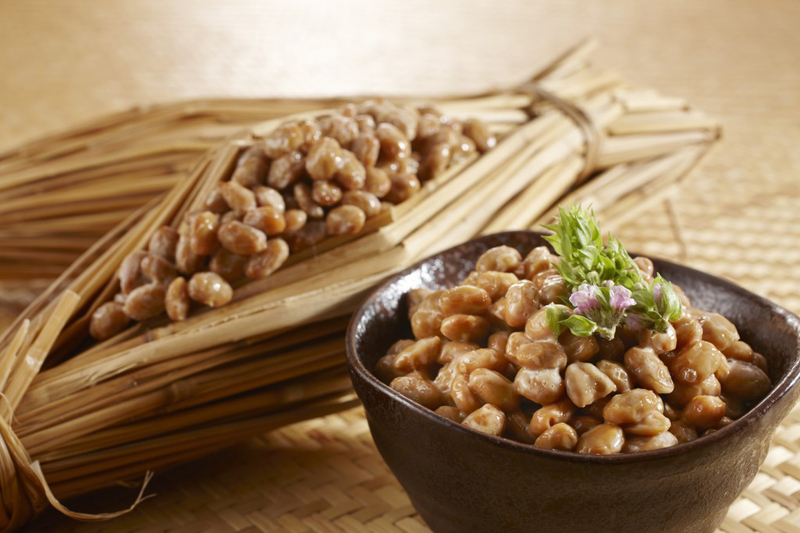 Natto helps to purify blood which is essential for maintaining healthy skin. Doctors recommend to include Natto to the regular diet. It is a great choice for those who are looking for longevity and vitality. It contains isoflavones and flavonoids that help to counteract breast cancer and cancer. It prevents Alzheimer’s disease and provides protection from heart diseases and heart attacks due to the presence of phytoestrogens and blood thinning effects. Simmer dashi in a soup pot. Put spoonfuls of Natto into liquid. Simmer it for two minutes. Place miso pastes into a pot and by using back of spoon dissolve the pastes into dashi. Then add wakame and tofu and again simmer it for 30 seconds. Use scallions to garnish the dish. Combine Natto with 2 tablespoons of soy sauce. Press the water out of tofu. Then cut tofu into small pieces. In a bowl, combine Japanesesake, soy sauce, Doubanjiang and mirin into seasoning sauce. Set it apart. In a frypan, heat oil and add chopped leek, garlic and ginger. For a while, stir fry it. When the leek becomes half transparent put it in Natto and seasoning sauce. Combine and heat quickly for a short while. Then add tofu and fry till Natto is mixed with tofu. Add some hot water if required. Sprinkle Shichuan pepper and serve atop with freshly steamed plain rice. Calories in 1 cup (175 gm) 369 Kcal. Calories 369 Kcal. Calories from Fat 173.25 Kcal.